Pests: Get out of my garden! See that hole on the side? It's the second one in two days! Stop, pests, stop! I don’t want to share with you! 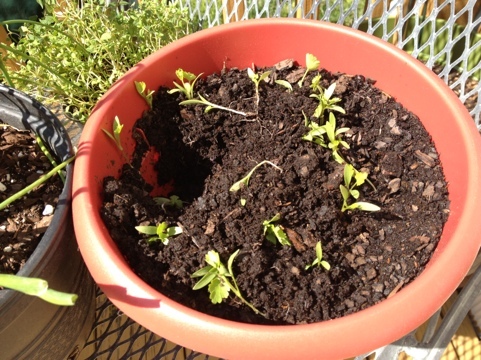 I want this cilantro for myself, and the tiny lettuce plants that you have been trying to dig up are mine too. I know you will continue to work your way into my garden throughout the summer, and I will have to fight with you to get to my tomatoes first. But can’t you just leave these tiny plants alone so they can have a chance to survive? I have grand plans for these herbs and greens, and I have invested time and money in them. So please, just leave my plants alone!